Glasses Frames | Sizing information and more. 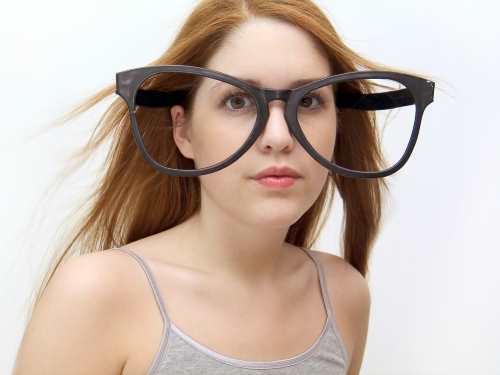 Glasses Frames- How to choose the right size eye glass frames. When shopping for glasses frames, whether for prescription or non prescription, it is really important that you choose one that fits properly. Ideally, the glasses frames should be wide enough so that the temples, or 'arms', go straight back to your ears without putting pressure on the side of your head. That pressure can result in headaches and unsightly dents in your head, and nobody that I know wants dents in their head. Glasses frames should also not be so wide that they slide down your nose all the time. *This is a rough guide. The thing is, is that the extension of the temples and the bridge width can make a big difference in the "fit". A 46-22 can fit the same as a 48-18. Both are 114mm across. The length or width horizontally, of one lens in millimeters (mm). The length or width of the bridge, again, in millimeters (mm). The length of the temples in millimeters (mm). 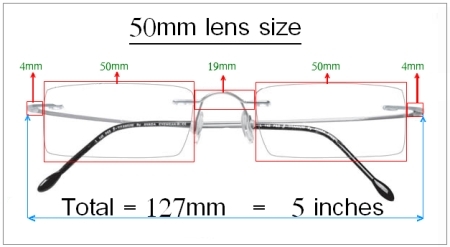 So a typical size might look like "51-19-135" (lens-bridge-temple usually printed on the inside of the temple) This information is important to opticians but because of the widely different frame styles available, these numbers are fairly meaningless to most eyeglass shoppers. However, knowing what these numbers represent can help you to understand exactly what you are getting, especially in combination with the frame fit. When available we also provide the lens height. The height, or depth as you may, is the mm measurement from top to bottom of the lens. If you know the total width in inches, of eyeglasses that fit you, then just pick the lens size that most closely corresponds.